In the past year, we’ve seen multiple pioneering brands and retailers implement 3D and AR for e-commerce, and data from these early integrations inspired the wider segment of companies who are beginning to leverage the technology today. As mainstream adoption continues to grow, we wanted to take a moment to highlight the innovators who jumped in early, paving the way for each e-commerce vertical to redefine the consumer journey via the smartphone. Sunglass icon, Ray-Ban, released a “Virtual Try On” app, where consumers can try on a variety of Ray-Ban sunglasses in the app. This technology is almost antiquated by now as it relies on video capture of a user’s face to map the sunglasses post-processing. The experience, itself, is a little bit clunky, but the result is a realistic view of what you look like in Ray-Ban sunglasses, without having to visit a store. Fashion loves the runway and Spanish retailer, Zara brought theirs to in-store windows via augmented reality. Users can access the experience through scannable markers found in a select 120 stores and store windows. The AR experience includes models in Zara apparel walking the runway and striking a pose. From there, shoppers can click through to buy the clothes. This experience, while limited to specific stores, was an exciting marriage of digital technology and in-store interest. Furthermore, the experience was shared with consumers post-purchase via markers printed on delivery items, sharing additional shoppable looks available to buy. Shoe brand, Converse, developed an AR-enabled app to drive e-commerce conversion. The app allows users to try on a shoe by pointing the phone towards their right foot, then buy the same pair directly from the experience. Converse also included the option to share an image of the AR experience on Facebook, enabling indecisive users to gather feedback from friends. This particular app was released in 2010, well before most companies were dabbling in what we know as AR commerce today. Retailer Tenth Street Hats tapped yours truly to integrate 3D versions of their hats for the web. This implementation is exciting because it involves 3D products that lead to a virtual try on experience on the web–without an app. It is accessible to anyone on any browser, which, when it came out, was a first. Tenth Street Hats later reported a 33% increase in conversion and a 74% increase in engagement. Big box retailer, Target recently launched their AR QuickLook integration, enabling anyone with iOS12 to experience their products in AR. This is an exciting early implementation, which we applaud, but Target’s 3D models could use some improvement. We checked out a few of the products ourselves and noticed issues with specific object surfaces–something that can happen if your 3D asset pipeline isn’t optimized for scale. In the case of 3D model creation, one size does not fit all. That said, by leveraging the power of Apple technology, Target has enabled a better experience for its iOS users. In 2017, IKEA released their AR app allowing shoppers to explore and place furniture just about anywhere. Like most of the examples we’ve referenced so far, this is limited to in-app, so users must download the IKEA Place app to experience it. 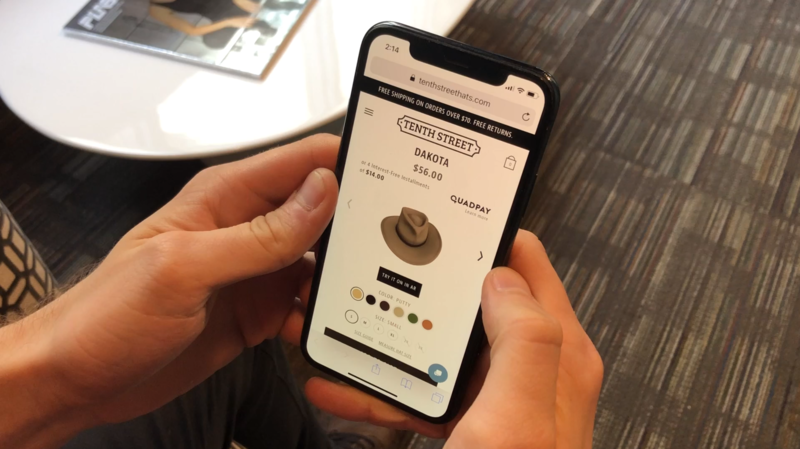 Once the item is placed, the item name appears in the top left corner of the screen, where users can tap to access a direct link to the shoppable product. The thing that is particularly useful about this app is the fact that you can place multiple items in one scene, essentially shopping a look, as opposed to just one thing at a time. Right around the time IKEA was introducing AR shopping, Home Depot had the same sentiment, incorporating AR into their app with a visual search feature that suggests furniture based on scanned items in your mobile view. After tapping on the camera in the app, users are encouraged to scan their environment to find items they’d like to replace. This is an interesting way to approach search, and when it works, it’s great, but object recognition isn’t completely reliable or fast, so the result is often unfortunately frustrating. French beauty retailer, Sephora, enabled virtual makeup try ons in their app for makeup products. Users can shop makeup via a live AR demo or by uploading a photo. From there, they can tap to add the item to their basket, and checkout directly in the app. In addition to shopping looks, users can scan items in their world to color match shades of, for example, lipstick. Rimmel London came up with an app that snaps a photo of someone wearing certain makeup looks and users can identify similar products based on the photo to try the respective look on themselves. This is a clever way to approach shopping, especially given the access and impact of influencers today via social media. A very specific use case that involves hand recognition, ManiMatch scans your hand, then lets you choose from any number of Sally Hansen nail products to virtually try on. Users can share and easily place colors in their shopping cart for purchase. Jeep created an in-store experience to allow auto shoppers to access and customize the Jeep Compass both from inside and outside the car before the vehicle was released and available in showrooms. A great example of how AR can enhance in-store experiences, this early application helped customers better gauge what ownership of the vehicle was like before it was even built. In late 2017, retail giant Amazon released an AR shopping feature into their iOS consumer app, establishing for anyone who is paying attention, that 3D and AR product views matter. Tap the camera icon in the Amazon app to view select products from electronics to decor to luggage in your space. If Amazon is the one to beat, it’s safe to say that 3D and AR commerce should be a priority. While we covered only a handful of verticals, we expect to see immersive commerce integrations across product types, including sporting goods, fine art, appliances, electronics, musical instruments, B2B, and more. The other thing worth noting from this list is the fact that nearly all of these use cases are app-based, limiting the experiences to shoppers who are willing to download and use a brand or retailer’s app. Given the exponentially larger reach web-based 3D & AR integrations afford, it makes sense for brands and retailers to prioritize these implementations directly on their current online product pages. The future of immersive commerce is here, and for maximum reach and seamless scale, look to the web.